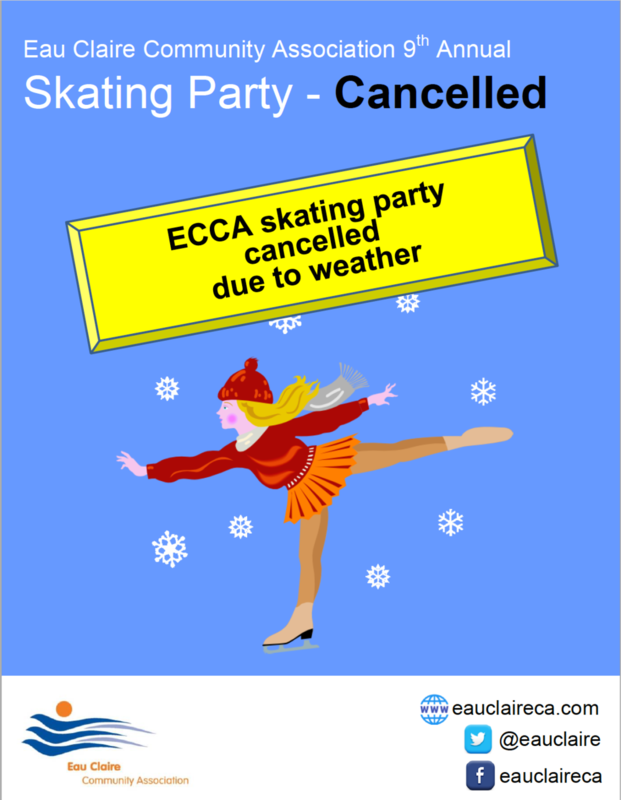 Due to the inclement weather we have had this winter we are unable to host our annual skating party. We are sorry to all who were looking forward to attending. The lagoon skating surface is at the mercy of Mother Nature and unfortunately it’s no longer usable this season. Next year the party will be twice as good! Get your tickets now to our popular social event this Thursday June 21 from 5-8 PM. Enjoy tasty appetizers and drinks with your neighbours in a favourite local restaurant. This event is supported by your membership fees, so tickets are only $15 each. Contact us at info@eauclaireca.com to order yours. The 2018 ECCA Annual General Meeting takes place on Wednesday June 6 at Centennial Place, 250 - 5 Street SW (3rd floor, West Tower - Conference Centre). Updates will be provided on the operation of the ECCA as well as projects and news affecting our neighbourhood. Registration is at 6:30 and the meeting runs from 7 to 9 PM. Wine & cheese will be served following the meeting. All residents are welcome and encouraged to attend. The ECCA is proud to support the 2018 YMCA Strong Kids fundraising campaign. A team of intrepid ECCA board members and friends will be participating in the Cycle for Strong Kids on March 5, the campaign's official kick-off. Come cheer us on at 5:00 PM in the lobby of the Gray Family Eau Claire YMCA as we spin our little hearts out on stationery bikes. The more money we raise, the faster we will be motivated to spin! Please support Strong Kids and donate to the ECCA team. Learn more about how your donation to the Strong Kids campaign helps kids and families. Thank you for supporting a healthy community. Come one, come all! Please join your neighbours for the Eau Claire Community Association skating party on Sunday February 11 from 11:00 AM to 3:00 PM. It's the 8th year for this popular event on the Prince's Island Park lagoon. As always, free skate rentals and helmets are available for all ages courtesy of the KidSport skate shack. Our neighbours at Shaw are kindly providing free hot chocolate and cookies to keep your energy going. The roaring firepit will keep you warm no matter what the weather. Try your hand at pond curling, learn about local wildlife at the nature interpretation table, guess how many candies are in the KidSport fundraising jar and take it home! Your board members and volunteers look forward to seeing you there. To help welcome Canadian Blood Services to the neighbourhood, the ECCA is holding a blood drive from November 15 to 30, 2017. The permanent donor clinic relocated to the Eau Claire Market in July, so it's easier than ever to give the gift of life close to home. The Eau Claire clinic is the largest in Canada, with 20 donor beds. The market's underground parking garage even has free designated stalls for donors. The ECCA kicked off the blood drive by holding our November meeting at the new clinic and several board members rolled up their sleeves to donate. Did you know that every 60 seconds someone in Canada needs blood? You can read stories of real people helped by blood donations. Donors from 17 to any age are welcome - there is no longer an upper age limit. Take a quick quiz to find out if you are eligible to donate. To make an appointment, call 1 888 2 DONATE (1-888-236-6283), book at www.blood.ca or use the GiveBlood app. Let the ECCA know about your donation through Twitter (@eauclaireca and ), Facebook (www.facebook.com/eauclaireca) or email (info@eauclaireca.com). Let's see how many donations we can make as a community. Remember, it's in you to give! In celebration and recognition of Calgary’s gender and sexually diverse community, the Calgary Pride Parade will take place on Sunday, September 3rd from 12:00 PM until 2:00 PM. This year's festival anticipates over 60,000 attendees and everyone is welcome to join. Departing from 6 Ave and 3 St SE, the parade will run west along 6 Ave, turn North onto 6 St and end at 3 Ave. From there, participants will continue walking onto Prince’s Island Park where the Pride in the Park event will immediately get underway. There are many ways that you can get involved, from volunteering, to decorating the front of your business (Calgary Pride encourages you to post photos on their social media), or even just setting up a chair and taking in the event. The Parade and Pride in the Park are free, all-inclusive events. Map of road closures and the parade route is available at calgarypride.ca. For up-to-date road closure information please visit calgary.ca/trafficinfo. Wine & cheese will follow the meeting. See you there! Join your neighbours for a glass of wine and some tasty appetizers on June 8 at Oceana's restaurant. Get in touch with your condo building's ECCA board member for tickets or contact us by email. Come celebrate Canada’s 150th anniversary with some outdoor fun! The Annual General Meeting of the Eau Claire Community Association will be held on Wednesday June 8. Registration begins at 6:30 PM and the meeting takes place from 7 to 9 PM. Location is 250 5 Street SW (Centennial Place), on the conference level. For further details, check the event poster. March 7 marks the kick-off to the YMCA’s Strong Kids campaign and the ECCA will be there! YMCA Strong Kids is an annual fundraising campaign to raise resources to support proven YMCA programs that give kids the opportunities they need to reach their full potential. The goal is to help kids live healthier, happier lives today, and grow into productive adults in the future. Show your support by donating to Team ECCA. Calling all Eau Claire cyclists! Join your neighbours for festivities and a gentle, family-friendly ride on June 21 along the new 5th Street and 12 Avenue Cycle Track. Get some exercise and enjoy our beautiful city from a new vantage point. If you’ve been thinking of dusting off that old bike, now is the time! Show up at 9:00 AM for buskers, baked treats and bike maintenance. The ride leaves the Peace Bridge at 10:00 AM and goes to Barb Scott Park at 12 Ave and 9 Street SW, where even more festivities continue until 3:00 PM. More information about the expanded Cycle Track network is on the City of Calgary Cycle Track Network page.